Bitsquare.io Review 2019 – Scam or Not? In the world of Bitcoin exchanges having a company that sells and buys bitcoin would always come synonymous of service charge and how Companies position themselves in-between these transactions. We have seen a lot of companies that have fallen just because of this specific design, but in most cases, greed is simply the problem. Now on the other hand; we’ve got Bitsquare.io, a group of dedicated people that are changing the world of bitcoin trading. Think of them as a farmer’s market in where you can buy goods directly without thinking about the stall fee which could greatly dictate the price of the goods being sold. Bitsquare.io has an open source peer to peer system that allows anyone to sell Bitcoin in exchange for international currency (FIAT) like US Dollars, Euros or Yen, and alternative cryptocurrencies. Bitsquare proudly announced its Beta release on the 27th of April 2016. The founder of Bitsquare and developer is Manfred Karrer, an Australian who lives in Barcelona, Spain where Fab Lab Barcelona is located. Manfred first heard about Bitcoin way back in 2011 and fell in love with it instantly! He also thinks that Bitcoin is the next best thing that came after the internet and still thinks of it that way until today. Another interesting fact about Bitsquare is that it is an open-source project, which means that this is funded by personal savings and donations from the community. In fact, they are not a company at all but rather a “Decentralized Autonomous Organization” (DAO) with ownership distributed depending on the participation of the project. This simply means that if you are willing to contribute then you might be the next shareholder in Bitsquare! This is what makes Bitsquare unique from most trading websites out there today as you are not required provide sensitive information over the internet. The technology is built from the ground up, that means that there are only a few of these markets operating today with the same platform as Bitsquare. With anonymity a part of the platform you are not forced into submitting Identification, Passports and even your legal name in order to start trading with them. 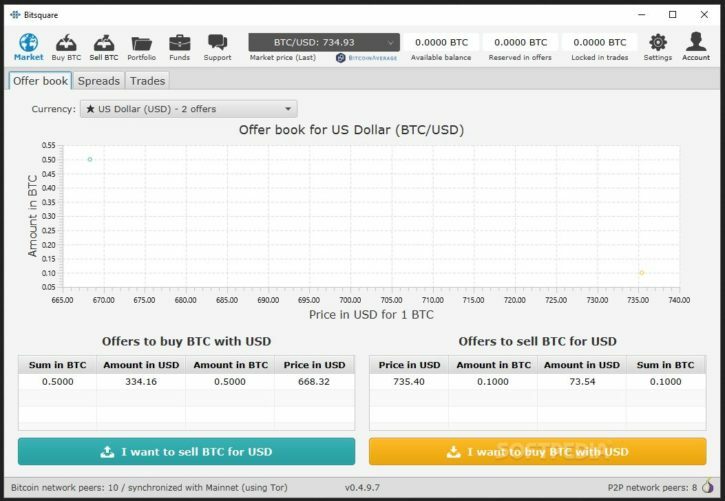 This definitely allows anyone in the world access to bitcoin trading anywhere and anytime! Without the traditional verification process like other websites, how do you start? All you need to do is download their software and start from there. 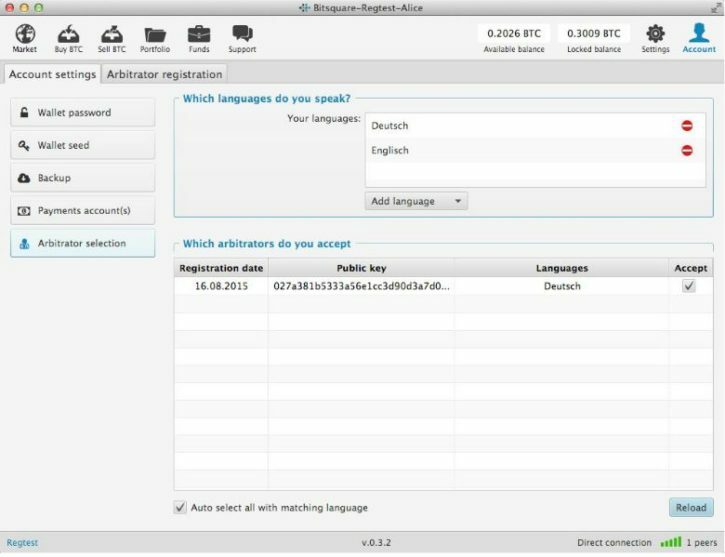 Once you have finished downloading and installing the software all you need to do is register a password for your wallet and you are ready to trade. When it comes to FIAT currencies, you would have a wide variety of currencies that you can choose from. You would have the usual trade giants like USD, EUR, YEN, BHD and a lot more! You can also get support for your favorite altcoin which can be processed in their forum. How does the trade process work with Bitsquare.io? This is where things get interesting. Unlike your regular trade websites, Bitsquare follows a different ideology in which decentralization is king. This means that every transaction is unique and your identity is kept safe. When a seller decides to part ways with their Bitcoin, they would need to deposit this into their Bitshares wallet and would need to create an offer that is broadcasted to everyone, or the buyer can easily take an order that was previously posted by a buyer. Now once that offer is seen by someone that is interested in it and accepts it, trading will begin. In order for both parties to start trading; they (buyer and seller) are required to make a security deposit of 0.1 BTC (holding fee) which is used as a collateral in case the deal would go south. Of course, the seller and buyer will also be required to pay transaction fees and arbitrator fees regardless of how the transaction goes. Once the transaction has started, both of the holding fees (0.1 BTC) and the bitcoins that are going to be sold would be placed into a 2-out-of-3 Multisig wallet. Who would be the three signature holders? The seller, buyer, and the randomly selected arbitrator. 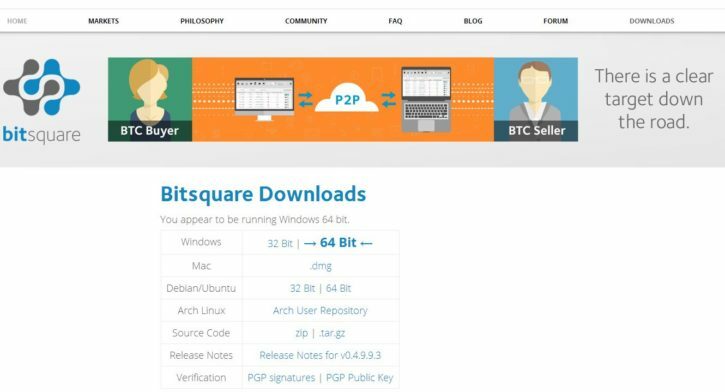 Bitsquare would never hold any BTC or FIAT currency. The BTC are locked up in the 2-out-of-3 Multisig and the FIAT currency is directly transferred from one trader to another. Since this setup is quite different from regular trading websites. A third party person needs to step in and make sure that the deal would go properly. Please be advised that these arbitrators are not employed by Bitsquare.io but are regular users of the software that can participate in the process by making a huge amount of security deposit. This ensures that everything on their end has to be done with all their honesty towards the transaction that they will be participating in aside from the fees that they would be receiving from both parties. Think of this as a contingency plan in case an arbitrator decides to keep the money and runs away. If in any case that this happens, his security deposit would then be used to pay for the damages of the transaction at hand. It is also very important that you choose your language when selecting an arbitrator for the transaction. This would maximize the success of your trade as there wouldn’t be any language barriers for both parties. When an offer is created, the person who created the offer will need to pay the create-offer-fee or trading fee to any of the arbitrators that he has selected. The selection process is automated and the taker fee would then need to pay the fees to the selected arbitrator. The public key would then be used to verify by each trader’s software. In addition, with this system, the arbitrator cannot be selected for his own trades. Trading fees that are charged to the seller and buyer are for the arbitrators that are doing an excellent job in making sure that the deals are done professionally. This would serve as passive income for them and even there are no disputes the Arbitrator would still want to be available 24/7 as they would have enough motivation to stay online. Trade fees are always fixed at 0.001 BTC (0.1% of the max trading volume which is 1 BTC). Bitcoin mining fee: 0.003 Bitcoin is included in transactions three times. A deposit from an external wallet, trade and the withdrawal to an external wallet. The sum would be 0.009 which is three times that of the original fee mentioned above. Arbitrators Security Deposit: Interested candidates need to pay a fee of 2 BTC. This amount is given back to the arbitrators on the day they would step down as an arbitrator. You can read more about the fees under their white paper. The website itself is very simple and easy to navigate. With all the important tabs located on the upper part of the page a first-time visitor would not be having problems navigating through it. You would have your Market tab in which you can view all the trades that can be done. From high and low trades to volumes, everything can be seen here and is neatly arranged by a chart. Now, who doesn’t like charts? You would also have direct access to their FAQ’s in which you can find most of the questions running through your head right now. A forum is also made for the community to discuss from Bitcoin news to the latest issues and bugs. 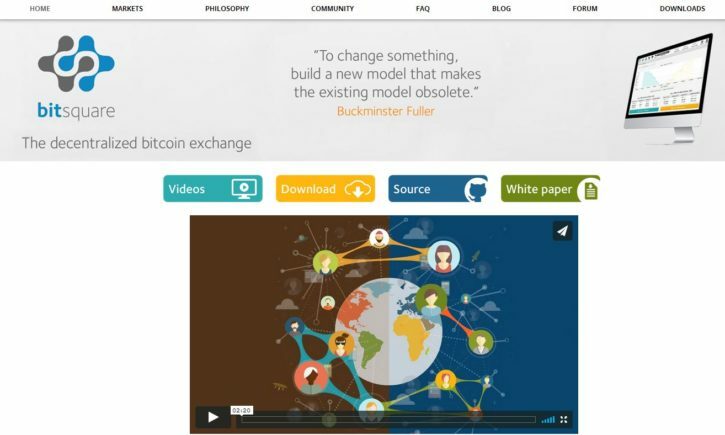 Below the main tab, you would also be given the direct links to their videos, source and white paper. Customer support might also be new to some of you guys as it also works for everyone. With the FAQ’s in check, around 99% of the questions can be answered on that tab alone. If you have unique questions or issues in hand, you can always post in their forums and get direct answers from the developer himself and get suggestions from the community. An in-depth software demo is provided by Manfred Karrer on this YouTube video that you might want to check out. Everyone loves Bitsquare.io! There might be someone out there that has something to say about the software right? Most of the complaints would just come from people that are not familiar with the decentralized platform and are mostly complaints out of not knowing how the new system works. You can follow a good conversation through this forum that I found regarding user experience. Due to the way the system is designed no hacks has been reported. Bitsquare is literally something different from most trade platforms that exist out there today. Their “off-grid” decentralized trading is something that you might want to look into. They just need to aggressively advertise their services to possibly get partnerships with other companies out there today. Read more about them, do research before you commit in trading.